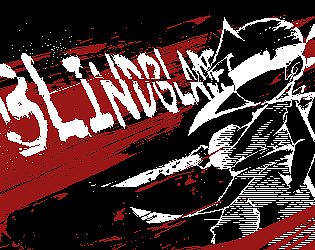 BlindBlade is a simple action game. But I think you will be playing for hours and can't control yourself, play over and over again. The theme of this GGJ is "Waves", so we designed a blind swordsman, who use sound waves to detect enemies and threats. The cycles nearby launches every few seconds to find melee enemies. You can't see anyone, but you can feel them by sounds and Murderous. Key X to launch a big wave cycle to find the archers(has cool down). The swordsman will always block the first attack, and will be killed if he got damage during the recovery. It's a 48 hours game, may have some strange bugs. Please tell us if you find it. Write your feedback, we like communication very much.